“American Hustle” is a very hard movie to classify, more so, because of its unorthodox approach to people rather than the con-game itself. The answer is an easy one, as easy to comprehend as the gradually unwrapping screenplay by Mr. Russell and Eric Warren Singer: the people on-screen, who are more interested in (brilliantly written) conversation, but not any out of the box actions; of course, the thing with very perceptively written characters is that almost every event they find themselves in, it is treated as an out of the box moment. Mr. Russell has a thing for the eccentrics. The more realistically messed up the better(other movies in his resume are “I Heart Huckabees”, “Silver Linings Playbook” and “The Fighter”). For “American Hustle”, Mr. Russell fixates on Irving Rosen feld (an excellent Christian Bale), a man whose dedication with setting his bad comb-over like wig, probably tells more about him than the inter cut recount of his past.Irving hustles the desperate little people, rather than going for the big-game, which, of course is sacred, dangerous grounds for any shady criminal living the “American dream”. Irving is not much to look at – a point stressed by his mistress Sydney Prosser (Amy Adams) –but “he had this confidence that drew me to him”, she confesses early in the movie. One meets people like Irving in real life (believe you me, you would have too): a smooth, confident talker, who has a pre-decided exit strategy for his con, but isn't really enjoying the experience. He is simply going through the motions. One can spot these people from the way they look at you:they are gravely concerned, but more for themselves than others – but it’s not like they are bad people;they are just trying to survive, because being a petty low-life is their only existence – or at least, one that they cling more to, out of habit but not necessity. Mr. Bale is a small notch above excellent as Irving, nailing the physicality and the subdue exactness of a very real character’s mindset, who is fragile, confined, but not really innocent. In a contrast-y parallel, Sydney is much like him, masquerading as “Lady Edith Greensley”, who has been lost in a life less ordinary. Ms. Adams, often excellent, is just okay-ish as Sydney, but that’s more due to her character’s handling by the material, and not anything else. The rest of the ensemble – Bradley Cooper as Richie DiMaso the overly zealous Fed agent,Jeremy Renner as Mayor Camden of New Jersey, who just wants to do good for his community, and Jennifer Lawrence as Rosalyn Rosenfeld, Irving’s self-possessed wife – have meatier roles. Ms. Lawrence and Mr. Rennerget smallish screen-times, who nevertheless are so overtaken by Mr. Russell’s take on them, that they come off more magnetic and cinematically apt than they appear on paper. Mr. Cooper, meanwhile, is slowly becoming a personal favorite. Never you mind his fetching looks, Mr. Cooper aces his fanatical, but very flawed and close-minded cop with as much gusto as Mr. Bale. 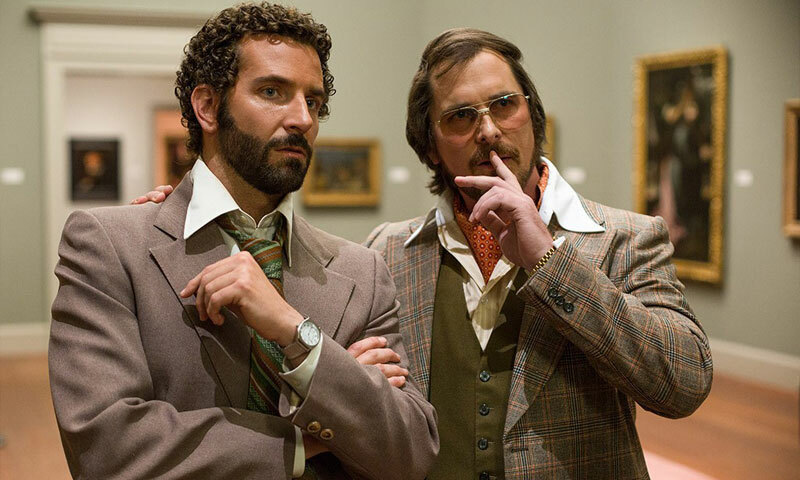 And lest I forget, “American Hustle” also casts Robert Di Nero, very late into a (wasted) bit-part, and Michael Peña as Paco Hernandez, a Mexican-American FBI agent who acts as a visiting Sheikh from Abu Dhabi, the lynchpin of the elaborate hustle DiMaso sets up. The job, of course, is botched, but Mr. Russell keeps our attention very much in place with his constant use of Steadicam-centered cinematography. In fact, as best memory serves, the movie is about ninety-percent – if not more – shot handheld. The way the camera tilts and how it follows people around is one Mr. Russell’s very astute, and rightly chosen filming choices as it helps maintain that this is indeed a very real movie, that may as well be fabricated because the characters are just too noteworthy (in a very unremarkable fashion) to be true. 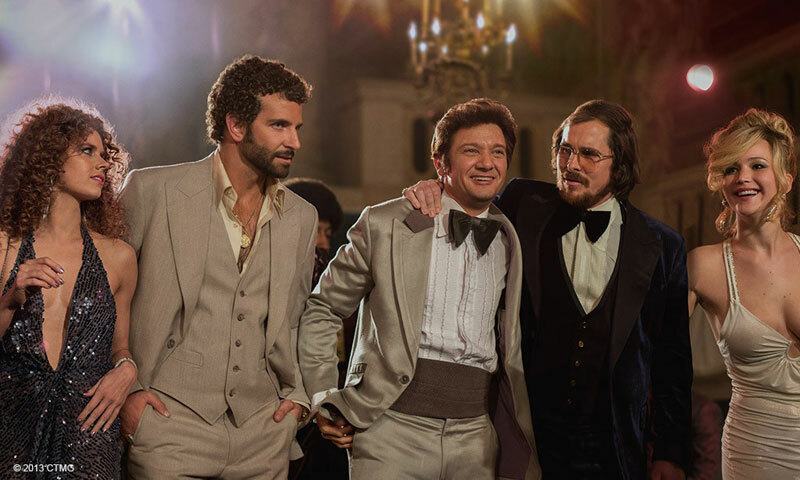 Released by Columbia Pictures and HKC Entertainment, “American Hustle” is rated R for adult themes and con-games. Directed by David O. Russell; Produced by Charles Roven, Richard Suckle, Megan Ellison and Jonathan Gordon; Written by Eric Warren Singer and Mr. Russell; Cinematography by Linus Sandgren; Edited by Jay Cassidy, Crispin Struthers and Alan Baumgarten; Music by Danny Elfman. Starring: Christian Bale, Bradley Cooper, Jeremy Renner, Amy Adams, Jennifer Lawrence, Michael Peña amongst others. Won't win the big one!